Safety Glass: Is It Really Safe? Safety glass: Is it doing what you think it does? The term safety glass inspires confidence, however sometimes that confidence is not really justified. The problem lies in the difference between what safety glass is designed to do, and what you might think it does. 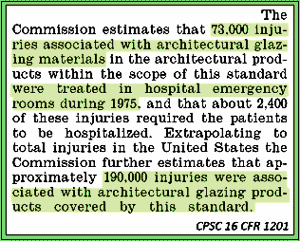 Since the late 1960’s, good people at such organizations as ANSI, CPSC and other groups have worked hard to develop and test safety glass standards with the goal of making the public safer. But safer from what? Safety glass standards ANSI Z97.1 and CPSC 16 CFR 1201 are all about reducing the risk of death and laceration in the event you fall through and break the glass. Such an accident can easily happen if you were to walk through a glass door lite or slip in the shower and fall against a glass shower enclosure. In fact, thousands of these occurrences prompted the development of the safety glazing standards. In architectural applications, tempered glass and laminated glass can be used interchangeably when the only criterion is the need for safety glazing. But they behave quite differently and because of this, they are not equally safe in all situations. For instance, consider a 10th floor balcony glass handrail. Let’s say the glass breaks for whatever reason (and tempered glass does have the ability to break spontaneously, even when nobody is around). If the glass is tempered, hundreds of small glass cubes will spray out onto the street with the first gust of wind. How safe is the pedestrian who is showered by a rain of glass cubes? Will they get in her eyes? But wait, those cubes don’t always fully disengage from one another. Sometimes the cubes of the “safety glass” cling to one another in clumps like tiny puzzle pieces. How safe is the pedestrian who is hit by one of these clumps? The edges of the clumps are jagged and abrasive as a hack saw blade. What about the child running around the balcony unaware that some of the glass handrail is missing? Eric Clapton’s 6 year old son Colin died in this type of tragedy. He ran right through an open floor-level window. 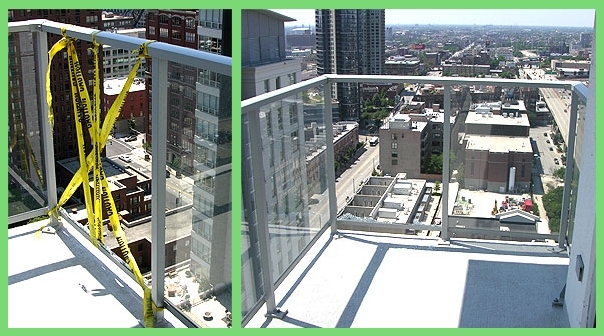 This Chicago highrise suffered breakage of tempered safety glass railing glass in a storm. The picture at left has caution tape to warn of the missing glass. The picture at right also has missing glass - the middle one. Hard to see, isn't it? A clue is at the bottom of the frame, a section of broken glass that remained in the frame. What about laminated safety glass? If it stays affixed in the railing framing, things look pretty good, right? But what if the laminated safety glass is not affixed well and takes flight like a flying carpet? Would you take your chances as a pedestrian below that? Anna Flores lost her life in 1999 in Chicago when a large piece of glass took flight and sailed across Wabash Street, over the elevated train tracks, impacting her in the head as she walked with her daughter. And what of people on the balcony with the full laminated lite missing? Absent the visual cues of a few shards remaining around the edges of the frame, even an adult might not notice that the railing is no longer a safety barrier. When balcony railing glass or floor level window glass breaks, tempered and laminated safety glass have quite different hazard profiles. Safety after glass breakage depends in good part whether, and in what way, the glass leaves the frame. 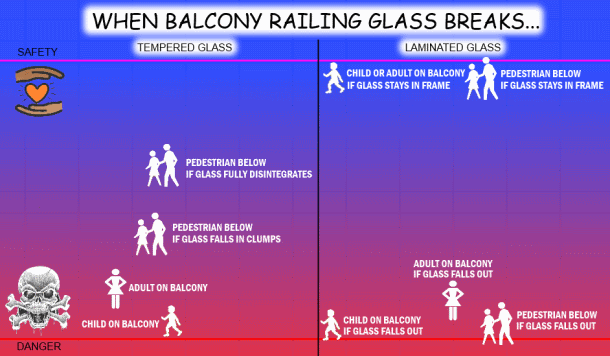 The info-graphic above illustrates the distinctly different hazard profiles of tempered and laminated safety glass using a glass handrail as an example, even though both are considered safety glass. The conclusion is quite simple: if the glass stays together and in the frame, a very good degree of safety exists even if the glass is completely broken. 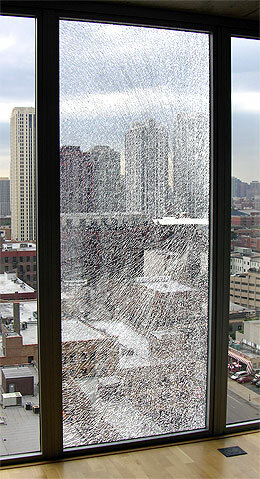 Broken floor to ceiling window glass in a condominium can be a falling hazard. Luckily, this window has insulated tempered glass. Only the outer lite was broken while the inner lite remained intact. We were able to stabilize the outer broken lite before it fell from the window frame. What Doesn’t Safety Glass Do? Safety glass is not designed to prevent you from falling through the glass. It is also not designed to prevent the broken glass from falling out and injuring people who might be below a broken window or balcony railing glass. That being said, properties of tempered glass and laminated glass will reduce such occurrences. For instance, tempered glass is considered to be 4-5 times stronger for resisting uniform loads than annealed glass. This greater strength will reduce the chance you will break, and therefore break through the glass door when you walk into it. Laminated glass will do a better job of keeping you from falling through the glass even if it breaks, but there is no guarantee that the heavy “wet blanket” of glass will stay in the opening, because that is not part of the design of safety glass. The limited definition of “safety glass” as a product that causes fewer serious lacerations when broken has reached a point of obsolescence. We need to move in a direction where a broader concept of glass safety becomes the new definition. In this new definition, glass safety will mean protecting people from not only cuts, but also from falling through the glass, and keeping the glass in the frame so it does not fall on people below. Kudos to the Eataly Restaurant on Ohio Street in downtown Chicago. 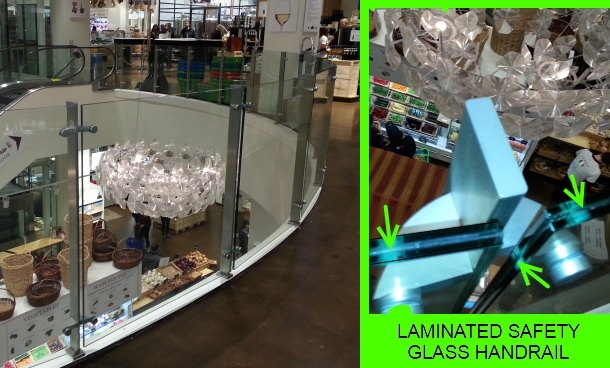 Glass handrail is laminated safety glass, not tempered. If someone breaks this glass, the glass will still be a barrier preventing a fall. 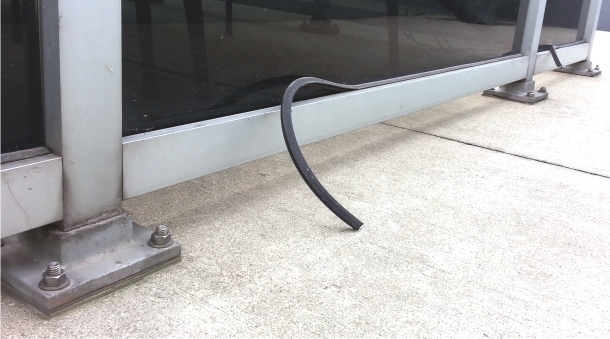 Loose glazing gasket on a glass handrail in a Chicago high rise can open the door to tragedy and litigation. Even safety glass must be well attached to the frame. Snug gaskets do this. If glass is allowed to rattle in the frame, it can break, leave the opening, fall on people below and leave people on the balcony unguarded against falls. Mark Meshulam, Chicago Window Expert was recently featured in this TV news story from KDKA-CBS Pittsburgh. See it here: How Safe Is The Glass Used In Doors And Window? Be sure to watch the video. Workman fitting a piece at the bottom of the skylight. This piece will connect the panel below to the skylight above.